Water policy in Milwaukee has evolved with both changes in scientific knowledge and federal law; as understanding of the ecological role of water systems and legal acknowledgement of hierarchical structures in the use of those systems has changed, so has the focus of Milwaukee’s water policy. Like other cities in the nineteenth century, whether extant or newly founded, Milwaukee found that the provision of services such as a reliable, appealing water supply was necessary in order to attract and retain settlers and commercial entities. As did most cities, initial provision was left to private business interests; only when these failed to meet the needs of the populace did the city become willing to undertake the necessary financial and administrative steps to provide water. In the early days of the city, access to water was easy; springs throughout the East Side bluffs and the West Side flat lands were abundant. Only in the ward south of the conjunction of the Menomonee, Kinnickinnic, and Milwaukee Rivers was there an excess of water. The swampy lands of Walker’s Point created a morass during rainy periods, and drainage, street sewers, and wells were first dug here to prevent cross contamination. It should be noted that while there was as yet no concept of germs or waterborne disease, people realized that sewage dispersing through the ground could affect the quality of water from wells. This was determined solely by smell and taste. If the water smelled bad, it was assumed to be bad. Water for commercial and industrial use was likewise easily obtained, as these facilities were located on the banks of rivers, lakes, or canals that provided for access to water for manufacturing and processing, and also for waste disposal. With increasing population and construction, the drainage of what became the downtown area of Milwaukee was changed. By the 1860s, the only functioning springs that provided a pleasant tasting and smelling water were located near what is now North 4th Street and Wisconsin Ave. (Wisconsin Ave.’s earliest name, Spring Street, reflects this origin). Private wells became increasingly polluted by waste from nearby privy vaults, and the increase of industrial discharge into the rivers and canals made these unsuitable as a source of supply. The policy that arose from the establishment of Milwaukee’s water works in the 1870s reflected federal law originating in conflicts over the use of the Delaware River. The use of water for drinking purposes came before that for any other use, including navigation and waste disposal. This approach applied to rivers, lakes, wetlands, ponds, and streams; title to, and the decision as to use, came under the jurisdiction of the state. In cases where bodies of water crossed state lines (such as Lake Michigan), the federal government retained title, except where Congress granted preference to a state or business under the “Commerce Clause” of the Constitution. The main focus of water policy in Milwaukee during the 1850s and 60s was whether it should be publicly or privately managed. Attempts to establish private sources of supply and distribution failed due to lack of capital; subscription rates were insufficient to permit the construction of large enough pumps to provide an adequate flow to businesses and residences and the city was unable to subsidize the private company as it was heavily indebted due to railroad speculation. It was not until the city’s debt load was largely eliminated that the scope of the water supply could even be addressed. It was eventually decided that water supply would be a publically managed operation, but the dominance of business interests in the establishment of, first, the Board of Water Commissioners, and later, the Board of Public Works determined that making a profit would always be a strong influence on the city’s operation. For much of the first two decades after the construction of the Water Works, supply issues were the focus of policy. In 1879, citizen complaints that the water was contaminated led to city engineers’ conducting a survey of industrial waste disposal. The result was the subsequent creation of intercepting sewers to prevent industrial waste, largely from slaughterhouses, from entering the water source. Dumping of garbage into the lake created further complaints in 1886, leading to the construction of the river flushing station to assure that wastes were driven away from the zone where the Water Works’ intake was located. 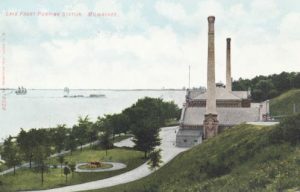 The 1892 dumping of garbage from what is now Doctors Park in Whitefish Bay led to the creation of garbage incineration to eliminate the use of the lake as a waste disposal zone. Another supply issue was which wards should receive water in which order; political clout rather than population ended up being the determining factor. Despite high population density and overcrowding, South Side immigrant wards were denied service, even when supply was readily available. The profit-minded focus of the Water Works instead led to the sale of water in wholesale quantities (thus eliminating the need for the expense of constructing distribution mains and pipes) to businesses and other municipalities outside the city boundaries. Profits were not returned to the Water Works but to the city’s general fund, preventing tax increases and allowing the mayor and council to distribute surplus funds as a reward for political support. By operating in this fashion, Milwaukee was following the trend of most other cities that used a public system. By the early years of the twentieth century, the gradual acceptance of germ theory by doctors and public health specialists, and the recognition of the waterborne characteristics of typhoid and other diseases led to calls on several fronts for the treatment of the water supply. In 1910 a new intake had been dug that brought water from a point further out in the lake, but chemical treatment was opposed by many large manufacturers with the argument that this cost would unduly burden them. Since industrial uses of water accounted for the vast majority of consumption, treating all of the water to ensure the purity of the twenty percent actually consumed was unfair to business. The State Railroad Commission (later the State Utility Commission) had jurisdiction over rates; they sided with the manufacturers. In 1913, however, the Health Commissioner strongly recommended the addition of chlorine to the water during summer months, and a 60% reduction in the typhoid death rate resulted. In 1914, the treatment was made year-round. The election of a Socialist majority in 1910 had advanced the idea of a water filtration and treatment plant which had been overwhelmingly approved in a 1908 referendum. The two-year mayoral terms prevented Mayor Emil Seidel from being able to gain council approval for the plant’s construction, although the return of a Socialist mayor in 1916 Daniel Hoan would return the proposal for consideration. It would take until 1934 before the treatment plant was finally approved and construction was begun, largely because of political opposition from manufacturers who opposed paying higher rates for treated water. The years of opposition culminated in a legal case that moved from local to state and federal courts. Eventually the state and federal courts would rule the city had the right to treat and filter the water, and that the costs of building a facility to do this could be passed on to customers. Despite the approval, political wrangling delayed a vote on building a water plant in Milwaukee until the Depression hit and at that point no funds were available to build the plant. It would, however, be built, using funds provided by National Industrial Recovery Act. Construction began in 1934, and the plant was completed and went online in 1939. Despite the court rulings, the city, directed by Socialist mayor Daniel Hoan, chose not to include any of the construction costs in figuring rates, preferring to keep them low in an attempt to use access to clean water as a stratagem for convincing unincorporated areas and suburban wholesale customers to annex themselves to the city. The use of water supply as an incentive for unincorporated areas to annex themselves to the city was possible because state legislation permitted the city to provide water outside its boundaries and to annex land, even if it was already part of another incorporated area. The first provision had been to the Milwaukee Soldiers Home; wholesale provision to the county grounds in Wauwatosa, North and East Milwaukee, West Allis, Greenfield, and Cudahy followed. By 1910, the city was making a substantial profit on the extramural sales, as it applied a 25 percent surcharge while being spared the cost of building and maintaining a distribution network in those areas. The Socialists, in particular Hoan, decided to use this service provision to expand the city. While the city voted in 1912 to shut off service to any suburb that had not applied for annexation, the suburbs received help from the state legislature, which required that when a city was providing water to adjoining towns or villages, they could not cease so doing except for non-payment. The 1920 federal census results showed that Milwaukee was the nation’s second most densely populated city; the attempt to annex land to relieve the congestion would be a major plank in the Socialist platform for much of the next four decades. Suburbs were quick to use the legislature and the courts to avoid losing either their autonomy or their water; the city countered with rate increases and threats to cutoff supply. The arrival of the Depression temporarily ended threats of both shut off and annexation on the city’s part, but the suburbs were unwilling to forego legal maneuvers. An extended period of litigation from 1935 to 1942 finally determined that while Milwaukee had to continue to provide wholesale water to the areas it was already serving, extending service to incorporated areas that had refused annexation was unnecessary. During World War Two, the city provided water in those circumstances, but was careful to ensure that contracts were with the federal agencies running war materials facilities and not with the suburbs themselves. Cautious annexation since 1920 had relieved some of the congestion of the 1920s, but fears of industries locating outside the city to take advantage of lower tax burdens kept Milwaukee active in the provision of water only when coupled with annexation to the city. The end of the war led to the rapid annexation and subdivision of the remaining unincorporated areas in the county. Milwaukee and the suburbs competed block by block to attract property owners, using the carrots of water supply versus lower taxes; the result is extremely piecemeal western borders with Wauwatosa, Greenfield, West Milwaukee, and West Allis. The suburbs attempted to override the power of the city by using the political animosity of the state legislature to attempt transferring control of the Water Works from the city to the Sewerage Commission, which was dominated by the suburbs. Some of the suburbs even commissioned independent engineering studies as to whether new waterworks could be built to bypass the city’s monopoly. Faced with the possibility of losing the income from its extramural provision, the city agreed to continue serving the suburbs, with the proviso that water rates would increase to cover the costs of building a new treatment plant to provide sufficient water to meet the extended demands. However, the villages of Whitefish Bay and Fox Point, previously wholesale customers, and the newly incorporated City of Glendale, constructed their own water treatment pumping and filtration plant, serving those three communities. 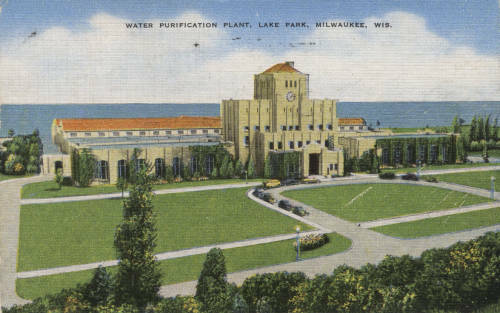 With the construction of a new filtration plant on the South Side of Milwaukee, it was expected that all the needs of the expanding urban population, both city and suburbs, would be met. Choosing not to associate itself with a utility that had been frequently mired in litigation regarding service issues, Oak Creek decided to construct its own pumping and treatment plant and won the contracts to supply Franklin and a part of the Town of Caledonia in Racine County. That facility began operations in 1974. Milwaukee’s estimate of the daily gallons pumped was therefore greatly in excess of the actual demand, allowing for parts or the whole of each treatment facility to be cycled in and out of service and maintenance. By 1985, the issue of water in Milwaukee County focused on continuing supply, preventing the diversion of Great Lakes waters outside of its drainage basin (as detailed in the Great Lakes Charter), and counteracting the disposal of complex organic chemical and agricultural waste that was newly identified in Lake Michigan and other inland waterways. The 1993 cryptosporidium episode reintroduced the topic of local contamination of the water supply, in that the organism was not routinely tested for; there were no existing regulations and little science on the topic. Public interest in the maintenance of a clean water supply rose dramatically. The Great Lakes Compact, which legally binds the states in the lakes’ basin as well as the Canadian provinces of Quebec and Ontario to regulate the protection and retention of the waters in the lakes’ drainage basin received widespread approval. The Council of Great Lakes Governors, which guided the negotiations that resulted in the Compact, now serves as secretariat to the Governors’ Compact Council created by the Compact, and operates as the Conference of Great Lakes and Saint Lawrence Governors and Premiers. The Compact prohibits the removal or diversion of water from the basin without the permission of all of the Commission’s governors, who are obliged to rely on the scientific and legal opinions of their state or provincial environmental departments. In 2013, the city of Waukesha applied for permission from the State of Wisconsin to withdraw water from Lake Michigan. The city’s water, historically drawn from a local aquifer, reached radium levels exceeding federal standards. After protests and later negotiations with state officials, Waukesha became obligated to find a new source of water by 2018. The city’s limits lay 1.5 miles outside of the Lake Michigan drainage boundary; however the county in which it resides straddles both the Mississippi (via the Fox River, which runs through Waukesha) and Great Lakes watersheds. The City of Oak Creek has agreed to supply the water from its facility. In the summer of 2016, the Great Lakes-St Lawrence River Basin Water Resources Council approved Waukesha’s request for Lake Michigan water. ^ Pollard v. Hagan, 44 U.S. 212; 3 How. 212, 11, L.Ed. 565 (1845). ^ Kate Foss-Mollan, Hard Water: Politics and Water Supply in Milwaukee 1870-1995 (West Lafayette, Ind. : Purdue University Press, 2001), 45-47. ^ Foss-Mollan, Hard Water, 54-56; 195-214. ^ Foss-Mollan, Hard Water, 65-67. ^ Martin Melosi, The Sanitary City: Environmental Services in Urban America from Colonial Times to the Present, abr. ed. (Pittsburgh, PA: University of Pittsburgh Press, 2008), 83-85. ^ Milwaukee Water Works Annual Reports, 1913, 1914. ^ Pabst Corporation, et al., v. WI Railroad Commission, 199 Wisconsin 536, 1929; McCardle v. Indianapolis Water Company, 272 US 400, 1926. ^ Public Service Commission of Wisconsin Report, vol. 194, p. 262. ^ Chapter 54, Wisconsin Laws of 1887; Chapter 231, Wisconsin Laws of 1897. ^ Foss-Mollan, Hard Water, 119. ^ Milwaukee Common Council Proceedings, 1911-12, pp. 539,591. ^ Chapter 389, Wisconsin Laws of 1913. ^ Foss-Mollan, Hard Water, 117-46. ^ City of Milwaukee v. Public Service Commission, 241 Wisconsin 397, 1939. ^ Daniel Hoan to George Gabel, February 7, 1927, Hoan Papers. ^ PSC Docket #2-U-4719, April 2, 1958. ^ Milwaukee Common Council Proceedings, 1958-9, p. 291. ^ NSWC website, accessed September 10, 2015. ^ www.oak-creeek.wi.us/wwwroot/index/history.htm, accessed September 10, 2015. ^ Foss-Mollan, Hard Water, 198. ^ Great Lakes-St. Lawrence River Basin Water Resource Compact Implementation, Council of Great Lakes Governors, accessed September 10, 2015. ^ Wisconsin Department of Natural Resources, City of Waukesha Water Diversion Application, November 19, 2013. ^ Wisconsin Department of Natural Resources, City of Waukesha Water Diversion Application, November 19, 2013, including status.